A gift always makes you feel special. If you have received a gift from some company then writing a business thank you letter is a sweet gesture. Formal thank you letter for gift received not only expresses gratitude but also informs the sender that his present has reached the receiver. Sometimes there is a letter to accompany corporate gift as well. 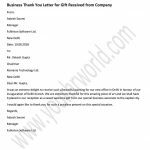 So if you also happen to receive gift from some business associate then make sure you take out some time to write a short thank you letter. Not only that Thank You Letter From Supervisor to Employee is a kind of Employee Thank You Letter. Even companies write Thank You Letter to Employees for Hard Work. Thank You letters surely build a stronger bond!!! To help you with it, we have come up with a sample template for Thank You letter for gift from boss, client or co-workers. Use this format to write your own Thank You Letter for Gift from Company. It was an extreme delight to receive such a beautiful painting for our new office in Delhi in honour of our inauguration of Delhi branch. We are extremely thankful for this amazing piece of art and we shall have it placed in our reception as a sweet welcome gift from our special business associate to the capital city. I would again like to thank you for such a priceless present on this special occasion. Supervisor is the person who knows the best about the performance of the employee. But it is not an easy job to gauge the performance. Supervisor has to be very smart at measuring the performance. When an employee joins an organization, he is given a certain designation to perform his role. Over a period of time, if he is performing well and additional responsibilities are given, he may be given a change of designation. Once you are done with a job interview, it is time to send a formal Thank You email or letter. But you can actually hamper your performance if you include certain things in your letter which should be avoided. When you are applying for a job, while submitting your resume, it is extremely important that you also write a formal cover letter with it. If you are applying for a job through a Recruitment Consultant then you must invest some time in drafting a professional cover letter with all essential details to make sure that your letter is able to deliver the information that you want the reader to know. This is the only opportunity you have to make a strong impression without your presence and you must not waste it at any cost. Here are some of the steps that you can use to create a perfect letter which includes the right amount of information. Be very sure of the kind of job you want to get into. Do not be confused or unsure about what you are looking for. Make sure your resume is drafted with all the important points, without any errors. Review and study your resume thoroughly before writing the letter as it will help you know what points you must discuss in your letter. Follow the format of a business letter. You must focus on using the right format as this would leave a strong impression on the reader. Be sure of addressing the person correctly. Font, space, paragraph etc. are to be used without any errors. Address the recipient as Mr. or Ms. You must also use “Dear” as greeting in your letter. If you are not sure of the gender then use “Dear” followed by the name. You must clearly state the reason for which you are writing the letter in the first paragraph. Keep it straight, clear and short so that there is no confusion. Introduce yourself in 1-2 sentences. Keep it short but informative so that the recipient knows about you. Now it is time to mention the job profile for which you have applied. This will avoid any kind of confusion as far as your job application is concerned. You must keep it straight and short. Make sure you are able to express your interest in the job profile and the company in an enthusiastic and positive way. You must include all possible details related with the kind of job you are looking for. In order to develop the interest of the reader in your resume, you must make sure that you include your skills, interests, qualifications and experiences in your letter in a brief yet impressive manner. The idea here is to develop the interest of the reader so that he is compelled to find out more about you. But whatever information you are sharing in this paragraph should complement the requirements of the profile. The more convincing you sound, the brighter chances you have for getting selected for the next round. You must use your skill to sell yourself in the most impressive way so that you stand out of the crowd. While ending your letter, you must write a concluding paragraph which stresses on the fact that you are a suitable candidate for the profile. Thank the recipient for his time and consideration. Before sending the letter, make sure that you take out some time to proof read the letter. This is important to make sure that your letter doesn’t contain any mistakes or errors. Check for spelling mistakes, grammatical errors and other format related issues to ensure that everything is perfect. Once you have framed a proper letter, it is time to attach it with your resume. Make sure that your resume is correct in every sense before sending it across. Use these steps for creating a perfect cover letter for a recruitment consultant. Quick and easy guidelines on drafting perfect cover letters that never fail to impress. We all have heard from our seniors and read in articles that we must never send resume or job opening enquiry without a perfectly drafted formal cover letter. But despite putting in all our efforts we don’t even know whether someone is going to read it or simply ignore it. This post brings some of the simplest and easiest tips that help you write impressive cover letter that are noticed by the employer. So read on these tips and find out some of the easiest guidelines for framing cover letters that impress hiring managers without much effort. It is important that before start writing a cover letter, you should know that you have picked the right kind of letter as styles of letter differ depending you are writing it for sending it with your resume or for mentioning some referral for any other purpose. So before you pen the letter, find out the type. This is another point that can make a big difference. If you can find out whom you should be addressing you letter then it gives you the opportunity to personalize your letter and helps you take follow-up. This surely helps your letter stand out. If you want to get the attention of the employer on your application then you must find out if you have any friend or relative working for the same company. You can use Facebook or LinkedIn to find that and if you have someone who can refer you then this will surely add another star to your cover letter. Most of the times we don’t even make efforts to know if we have a referral. Never go for long cover letters as no one has time to read them. Keep it short and sweet, roughly one page long. Only a couple of paragraphs are good enough to deliver your thought. Don’t use small font to stuff more words as this would again majke it unpleasant to read. Any font is good as far as it is easy to read. Select from the standard fonts which include Arial, Times New Roman and Calibri. Avoid using artistic fonts as they are difficult to read plus add an informal appeal. You must use lots of white space to ensure high readability. Use space between paragraphs and signatures as they make your letter light in appeal and easier to read. With limited content and smart use of white space, you can make your letter impressive and readable. Whether it the format, font or content, there has to be a match between your resume and your cover letter or else they both will look unmatched and unprofessional. So make sure they synchronize with each other. There is no need to repeat what is already included in your resume. Your cover letter should include relevant information which is not very much highlighted in your resume like your skills, personality traits etc. which are important for the profile you are applying for. In order to create strong impression, you must establish a connection between requirements of the profile and your skills as this will again add more points to your cover letter thereby increasing your chances of moving ahead in the hiring process. It is very important to customize your letter keeping in mind the company to which you are sending the letter. This customization is possible by including the name of the person whom you should be contacting, including the referrals and including few points specific to the job or the company. With these tips, you can create an attractive and impressive cover letter which would never go unnoticed. So follow these guidelines and surely you will receive the interview call soon. If you are looking for a job and you came across an advertisement of a desirable job then you must apply for that profile by sending your resume but don’t forget to attach a properly drafted formal cover letter with it. This cover letter should contain all the essential details related with your work experience, your education qualification and any other professional details you wish to include in your letter. If you are not sure about how to draft a cover letter for an advertised job then given below is a sample example of the same which you can use for creating a personalized letter without missing on anything important. Use this template as reference to design your own. I maintain a savings account with ABC Developmental Bank and I really admire the way your bank deals with the clients. Recently, I came across an advertisement in the newspaper recently which talked about the opening of part time cash teller profile at your Central Road branch. I would like to bring to your notice that I am a college student, pursuing Masters in Management from California University and I am available to work 20-25 hours a week. I strongly believe that my prior customer service work experience will make me a good choice for this profile. As stated in my resume enclosed with this letter, I have an experience of two years as teller in a departmental store. I also have an experience of one year working with the same departmental store as customer care executive. During this time, I gained good experience in cash dealing and maintaining the teller with complete responsibility. I am very hardworking and honest in making cash transactions and also dealing with customers. In my previous job, I also received many compliments from the customers on my effectiveness and prompt working. I have also been honored with best employee twice during the phase of two years. Thanks a lot for taking time to consider my resume for the profile. I will look forward for your response on this and would be delighted to speak with you soon so that we can further discuss on the profile and I will be able to explain you how I am a good choice for this profile. It would be my honor to work with your esteem bank. You can reach me at 123-456-789. Cover letters are the documents which are sent with resume for purpose of job application. These documents provide additional information on the kind of work you have done or on your achievements. They act as an interesting tool in giving an insight on your strengths, your experiences, your qualifications which can actually helpful in creating an interest in the mind of the reader. Moreover, you can also use it to express your interest in the job opening and the company. Attaching a cover letter with your resume can actually be very helpful in creating a positive impression on the reader which can help you earn extra points. In order to make sure that you are able to send an email with a perfectly drafter cover letter, you must take into consideration the instructions offered by the employer on submitting cover letter and resume. This will help you write email cover letters with utmost precision and complete information. But this doesn’t mean that you write anything in the letter. Make sure that your letter focuses on presenting your experiences, skills and qualifications in a way that match perfectly with the job. Here are some very useful tips that must be kept in mind while sending a cover letter with your resume for a perfect professional conduct. Make sure that your resume is either in PDF format or in Word Format, if the job posting asks you to send it as an attachment. But in case the employer doesn’t accept attachment then paste your resume into the email message. Do not get into giving it a fancy look. Keep it simple and sorted. It is extremely important that your cover letter addresses the right person. You must find out to whom your letter should be addressed and send your letter to that person only as he or she is the one who is going to look into this process. The letter must include a briefing about your education qualification, professional achievements and strengths. The idea is to establish a strong connection between your profile and the needs of the position. You should be able to express your interest in the job along with the company. Keep this content short and sweet. It has to be good enough to share complete information with the employer so that he is compelled to read your resume. It is must that you include the position for which you are applying in your email’s subject line. This will bring clarity as there are various posts open and too many people are applying for all these positions. In order to avoid any room for any confusion, you must include the job post for which you are applying as subject of the email. When ending the letter, you must include your signature in it. You must also include your contact information so that the hiring manager can get in touch with you without any difficulty. Information should be handy. It is very important to check that your letter doesn’t have any grammatical errors or spelling mistakes. You must read it at least twice to ensure that your letter is perfect in its language and grammar as this is essential for your positive impression. Before sending the final draft to the employer, you must send this to your own self to know that everything is in place. And if all looks good, it is time to send it to the employer. Once all this exercise is done, it is time to send your email cover letter to the employer. A right cover letter can help you earn more attention and create a stronger impression. When you are going for an internship for the first time, it is obvious that you don’t have the experience but you need to start from somewhere. Make sure that when you are sending your resume to some company then you attach a cover letter with it which talks about your strengths and other working experience you have at the academic level. It is important because it helps you have an edge above the others. Below is a sample cover letter for internship with no experience. Customize and use it for writing your personalized letter to create a remarkable impression on the recipient. RE: Job application for Sales Executive position. I would like to apply for the position of Sales Executive with your company. I promise to be a dedicated and motivated employee working for the growth of the organization. I have always been an active participant during my school and have participated in many activities which have helped me developed strong communication skills, interpersonal skills and planning skills. I have always been involved in lots of events and activities like sports, dramas, debates and various competitions which have helped me work with my peers and develop skills to work in group. All of these activities have been very helpful in helping me learn organizational skills, planning skills and management skills which are very much essential in every professional, educational and personal life. I have been appreciated for my willingness to participate in different kinds of activities by my teachers and mentors. I enjoy making the optimum use of every opportunity that I get by participating in it working hard to accomplish the task that has been allotted. My high motivation levels and skills to communicate well have always helped me perform every task with great dedication and commitment. I know that you are going to receive lots of applications for this profile; some of them will also have experience but I would be very thankful if I get an opportunity to present my capabilities to you in person. I strongly feel that I can make constructive contributions to your organization. I am enthusiastic about developing my professional skills and I will look forward to discuss my job application with you at an interview. Please find the copy of my resume attached with the letter for your consideration. Please contact me anytime at the contact details mentioned above. Whenever you apply for a job, salary expectations and discussions turn out to be one of the most important points of discussion. It is always advised that you put a cover letter with a mention of your salary requirements to make sure that things are clear from the start. Here is a sample format to help you accomplish this difficult task in a smooth manner. Present your qualification, experience and talent in a smart manner followed by your salary requirements. I’m writing in response to express my interest in the profile for Web Design Specialist in ABC Technologies Pvt. Ltd. I have an experience of four years in designing consumer centric business websites of various kinds. I have worked in the industry for long enough to understand the needs of business clients which help me design perfect designs as per their needs. In my last company, y responsibilities included the task of designing and developing the site’s editorial voice along with managing the daily content programming. I was also in charge for production of the website. I worked closely with the clients to understand their needs and report them about the developments in the project at every stage. This has helped me become a great coordinator, communicator and relationship builder. I have the ability to interact impressively and keep the team focused at every point. I can within a team as well as cross-team. I have the experience of dealing with web engineers to help them resolve technical issues and simultaneously implement them to bring out the desired results. My salary requirement for the profile is in the $80,000 – $90,000 range. Thank you for your consideration. Looking forward for your reply. Sometimes it is not enough to put in years of hard work and simply expect for your promotion to happen. Sometimes you need to make an initiative to bring in notice to your manager that during this time frame you have earned additional skills which make you fit for a managerial position. If you are planning to apply for the management position with your same employee then it is important that you must submit your resume with a beautifully drafted cover letter which can explain your potentials and capabilities. Here is a sample format for the cover letter for promotion to a management position given for your quick and easy reference. I would like to formally apply for the position of Assistant Communications Manager in the Corporate Communications Department which has openings at present. As you know, I possess an extensive experience working with the company. I started my career with the company as a management trainee and this association is now 5 years long. Because I have worked in Human Resources and Marketing departments, I understand the style of communicating your thoughts and ideas to others. I have developed exceptional writing and editing skills that have strengthen my ability to communicate. My resume has a mention of all the accomplishments I have made during this tenure and how they will be helpful in performing my duties as an Assistant Communications Manager. I appreciate your consideration. I look forward to discuss my potential for this profile with a promise to take our company to newer heights. Corporate even planner is an important profile. To create that strong first impression, you must make sure that you attach a smartly drafted professional cover letter with your resume. Add more weight and value to your job application with such a letter. No matter, to which company you are applying to, you always need to attach a cover letter with it. Here is an example format of a cover letter for the same profile that has been mentioned for your reference. Please accept this job application for the profile of Events Planning Director at Elite Group of Companies. My extensive experience and success as an event planner make me a strong candidate for this opening in your company. As per your statement, you are in need of a candidate who has good experience in corporate event planning. I possess an experience of almost fifteen years in this industry. I have worked as a Senior Event Coordinator. During this tenure, I have planned and executed over one hundred and twenty corporate events that ranged from world class international meetings to fundraising events of all kinds. I have experience of overseeing all aspects of event planning for corporations which included finding appropriate venues, selecting vendors, promoting events through print and online media to make it a success. You have also mentioned that you are looking for a person who is also skilled in financial and contract management. In my last job, I handled different kinds of events of all sizes. I also exercised to ensure to have maximum cost saving. I identified ancillary revenue sources along with different cost-saving opportunities to ensure best arrangements in any kinds of budgets. I have always worked keeping in mind the needs of clients which helps me serve them with the best of the services. I am very confident and hopeful that my experience and expertise will help me become an asset to Elite Group of Companies. Please find my resume attached with the letter. Thanks for your consideration. If you find me a good choice then please give me a chance to discuss my abilities in person. If you are a teacher with an impressive experience then don’t presume that your resume is good enough to get you the desired job. You also need to pen a professional cover letter for the teaching position for that perfect impression. Gone are those days when you could just send your CV without a formal cover letter. Here is a format sample of a short and smart cover letter for teaching position with experience to help you create your own draft within no time. Follow it and create your own. classified advertisement in Daily News on November 11, 2014. I have an extensive experience in teaching kids which makes me a strong candidate for this job. I hold a Bachelors degree in Science in Elementary Education which is with concentration in English Literature from the University of Ohio. At present, I am working at Hello Kids Elementary School where I am talking English Language classes for students of Third and Fourth graders. In this, I am supposed to teach children skills to read, write and spell along with little journalism skills. This includes training children to write newsletters using computers in the classroom which are then sent to their parents. As mentioned in my resume, I am also an active member of the committee which is responsible for organizing regular reading programs to inculcate the habit of reading books amongst children. I strongly believe that I am gifted with the natural ability to mingle with kids and manage them. My energy, knowledge and experience combines together to make me a good choice for this position. Thank you for your consideration. Please contact me in case you are interested in receiving my credentials, I would be more than happy to provide them. Also contact me at 1234-5678 if you find me a right choice for this profile to discuss my abilities in detail. 79 comments - What do you think?